The Superior Contemporary direct-vent combines beauty, efficiency and value. 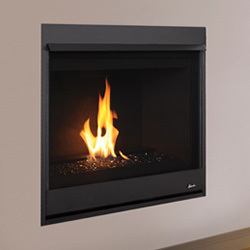 A clean faced heat-circulating design with a beautiful flame that rises through black crushed glass media. Top and rear dedicated flue models, a new compact horizontal termination, and a choice of millivolt or electronic controls. All models are equipped with a standard barrier that meet 2015 requirements. Innovative Hearth Products ("IHP") 20 Year Limited Warranty warrants your Superior® Brand gas fireplace, Stove or Insert ("Product") to be free from defects in materials and workmanship at the time of manufacture. The Product body and firebox carry the 20 Year Limited Warranty. Ceramic glass carries the 20 Year Limited Warranty against thermal breakage only. After installation, if covered components manufactured by IHP are found to be defective in materials or workmanship during the 20 Year Limited Warranty period and while the Product remains at the site of the original installation, IHP will, at its option, repair or replace the covered components. If repair or replacement is not commercially practical, IHP will, at its option, refund the purchase price or wholesale price of the IHP product, whichever is applicable. IHP will also pay IHP prevail- ing labor rates, as determined in its sole discretion, incurred in repairing or replacing such components for up to five years. THERE ARE EXCLUSIONS AND LIMITATIONS to this 20 Year Limited Warranty as described herein. COVERAGE COMMENCEMENT DATE Warranty coverage begins on the date of purchase. In the case of new home construction, warranty coverage begins on the date of first occupancy of the dwelling or six months after the sale of the Product by an independent IHP dealer/distributor, whichever occurs earlier. The warranty shall commence no later than 24 months following the date of product shipment from IHP, regardless of the installation or occupancy date. Parts not otherwise listed carry a 90 day warranty from the date of installation. Whenever practicable, IHP will provide replacement parts, if available, for a period of 10 years from the last date of manufacture of the Product.